Leading a music group can bring challenges as well as rewards, but how do you anticipate those pitfalls, read the signs and assess the harmony when you can’t see? Phil Chalker is a musician and music leader from Gippsland who co-runs ukulele and song writing workshops, encourages people to find their voice and organises Big Sing sessions too. When he was five years old, Phil was diagnosed with Retinitis Pigmentosa, an inherited degenerative eye disease that causes vision impairment and, in severe cases like Phil’s, blindness. Phil feels his personal experience and frustration of a mainstream education system which was ill equipped to deal with his needs has made him more mindful of the importance of being inclusive and remaining aware of group dynamics. It has influenced his preferred style of teaching and underpinned his desire to ensure that everyone feels at ease, within a group context, too. A couple of years ago, Jane and Phil established The Uklaimers, a ukulele group for beginners and players of all abilities in Morwell. 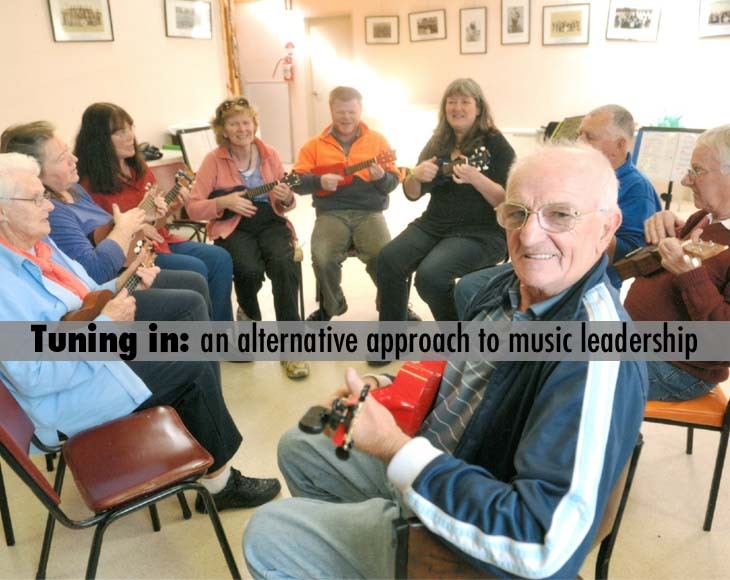 Co-running the group with Jane allowed Phil to observe her teaching methods whilst developing his own style in a supportive environment as he took the first steps in his goal towards autonomous leadership of a community music group. In addition to the usual challenges faced by group facilitators, Phil has to consider how to tackle his inability to respond to visual prompts, relying instead on his aural ability to detect issues such as fingers in the wrong place or the wrong chord being strummed. Tuning up the instruments for beginner students is also tricky, but Phil gets around this problem by using a talking tuner. Establishing good communication is vital to everybody in getting the most out of a workshop session and Phil gets a huge amount from feeling that he is enabling people to try new things and share the experience of learning with him. “I use oral cues such as ‘I do understand/ I don’t understand’. I make people turn the paper over and not look at it so that they learn the blind way. You can’t rely on reading the dots cos you can’t see them”. In addition to his music making, Phil is a tireless campaigner seeking to challenge the status quo about rights and access to the kind of things able-bodied people take for granted in life. Phil recently tried to organize a Big Sing for visually impaired and blind people, but had to cancel due to a disappointing lack of interest. Phil is a regular on the Traralgon busking circuit, frequently playing his ukulele around the town. As a child he would listen to Elvis and his bedroom walls were covered in posters of the King but it wasn’t until his late teens that he was interested in playing. Picking up a 12 string guitar whilst on work experience in a music store, Phil found he enjoyed singing along with the instrument and finding his own harmonies. With his personal musical seam well and truly tapped, Phil took his guitar to a Club Wild session run by Phil Heuzenroeder. He announced that he was “a muso just starting out” and found himself playing on stage that same night. This not only made him “so happy”, it encouraged him to believe in his ability. One thing Phil used to worry about was doubting that people’s positive response to his playing was genuine appreciation of what they were hearing and not because they felt sorry for him: “Having a disability makes you question whether people are clapping through kindness or clapping cos you’re good… are they clapping for me or clapping for Roddy?” (Phil’s dog). Phil’s story is a testimony to the importance and value of mentorship, skill sharing and support. Jane Coker and Phil Heuzenroeder were key people in his journey who met him head on and encouraged him to pursue his passion to teach and make music. In turn, Phil is himself a keen advocate of the work done by CanDo Musos, who support musicians with challenges, all over the world. He also runs Gippsland Disability Social Group. So, if you or anyone you know is feeling dejected about overcoming a challenge, point them in the direction of Phil’s website. The strength of his spirit and determination to make the world sit up and take notice of him as a visually impaired music teacher, working to enable other people, is abundantly clear. And there’s information about how to take part in the Big Sing sessions he is planning to run over the course of the coming year, too.